This was so festive looking I just had to grab a photo. This morning the breakfast table was a celebration of Spring, featuring brightly colored local daffodils and gorgeous fresh strawberries. 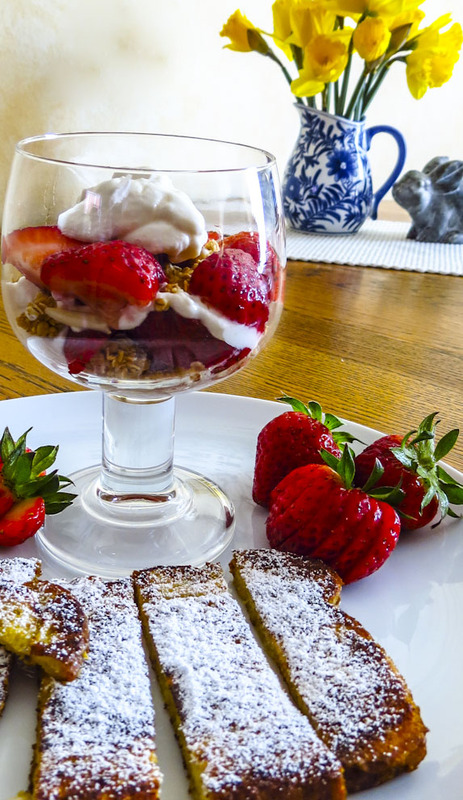 Just imagine the taste of those sweet berries layered with Greek Gods Honey Yogurt and some crunchy granola. Mmmmm, the accompanying French toast spears added another satisfying note. Oh yes, this will keep me smiling for hours. Spring weather has been changeable lately, varying almost minute by minute and neighborhood by neighborhood. Yesterday featured blue skies, heavy dark clouds, strong wind gusts, downpouring rain, random hailstorms and more blue skies with 38F weather. Today it's 52F with mixed sun and puffy clouds... so far. Sure enough, this sounds like Spring in Seattle.